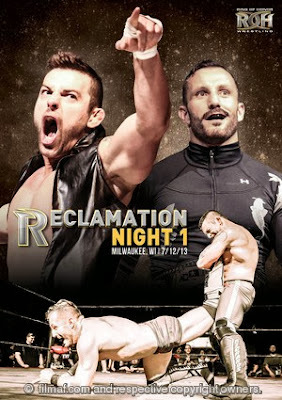 ROH Reclamation Night 1 is out now on DVD and available from www.rohwrestling.com, priced at $19.99 (just over £12 plus shipping) Taped at The Turner Hall Ballroom in Milwaukee, Wisconsin, USA on 12th July 2013, the show fits between Jay Briscoe being stripped of the ROH Championship, and the start of the tournament to find a new champion. The main event sees then World Tag Team Champion Bobby Fish take on Davey Richards, alongside a Four Corner's Survival Match with Adam Cole, Michael Elgin, Jay Lethal and World Television Champion Matt Taven, World Tag Team Champion Kyle O'Reilly's bout with Eddie Edwards and five other contests. ROH Reclamation Night 1 had a fairly tricky job to do, with no ROH World Champion at the time, and the tournament to crown a new champion still waiting to start, it could certainly have come across as the company treading water until All Star Extravaganza. Luckily, the empathasis on ROH's tag team division gave the show an identity of it's own. With members of the American Wolves facing World Tag Team Champion reDRagon in singles matches, and four of the competitors in the World Championship Tournament entering Four Corner's Survival there was a lot to enjoy on this show. The main event between the American Wolves' Davey Richards and reDRagon's Bobby Fish was an extremely strong bout, with Bobby Fish really stepping it up to take on the former World Champion. If you're familiar with either Ricards or Fish, you'll know what to expect from this one. Both men drawing on their stays in Japan throughout, to create hard hitting, technical bout. There's ridiculous spot on the apron, in the closing stages of the bout that send the crowd crazy, and looks extremely painful, and along with a crazy dive to the outside from Richards, really raise this bout into something quite special. With both wrestlers partners heading out to the ringside by the end of the match, the finishing sequence builds up nicely and satisfactorily continues the feud between the two teams. The Four Corners Survival match between Jay Lethal, Michael Elgin, Matt Taven and Adam Cole, begin as a series of different singles combination, with the competitors having to tag in and out of the ring. I'm not usually a fan of these kind of matches, the tag in/tag out system seems an illogical one, luckily the action here is good enough for me to look past it. There's a lot going on in this with, with all four men in the World Championship tournament, it's was a good indication of where ROH were going to go with the tournament. A lot of the bout is fought between eventually tournament finalist Elgin and Cole, giving the two to practice what they could do in that bout. Taven feels a little bit out of place with the bigger names, but is essentially there to take the brunt of the punishment from the faces, and will have come out of this a lot better than when he went in, even getting a nice false finish at The House of Truth got involved. With all four men involved in a crazy finishing sequence, this is a nice preview of what was to come with World title Tournament. Without sounding like a broke record, Kyle O'Reilly and Eddie Edwards bout is another strong contest. With a much different feel to the main event between their tag team partners, building up slowly with a lot of reversals and a lot of good amatuer style wrestling. There's a strong sequence involving monkey flips and pinning variations that is really well put together and the match really picks up from there. Whilst the main event had a typical Japanese Strong style feel, this feels like typical ROH with a much more sports based style, with the two looking evenly matched throughout. The finishing sequence see's a nice exchange of submission holds, that keep the loser looking competitive, which is always good going forward. The other bouts are a lot shorter than these three, but there's still a lot to enjoy. A women's bout between MsChif and Athena is a solid encounter between the two continuing their impressive run of matches for the company, with a shocking post match encounter. Michael Bennett and BJ Whitmer warm up for there World Championship tournament bout, it's just a shame that this is one of Whitmer's last ever matches. Tommaso Ciampa takes on Rhino in a bout that can't live it to the rest of the card, but is still entertaining in it's own right. The opening tag team bout between Adrenaline Rush and #PartyBoys has some nice spots but #PartyBoys still look out of their depth for ROH. Silas Young continues to impress, with a fun bout with former World Champion Kevin Steen. There's a couple of special features on this disc, with the highlight being a top quality promo from Bobby Fish on Davey Richards. Unfortunately, a Q&A session with Nigel McGuinness is harmed by poor sound quality and the lack of subtitles on the disc. A bonus match between Beer City Brawlers and ROH fan favourite Cheeseburger and Benjamin Boone is another nice addition to the set. Overall, this is a very strong event from ROH, with a lot of strong action throughout, that does a good job of hiding the fact that there are no championship matches on the card. There's a lot to enjoy here, but when looked at it in the grand scheme of things, it's pretty inconsequential card, especially when put up against later events All Star Extravaganza and Manhatten Mayhem. It will still however be a nice addition to anyone's ROH collection.